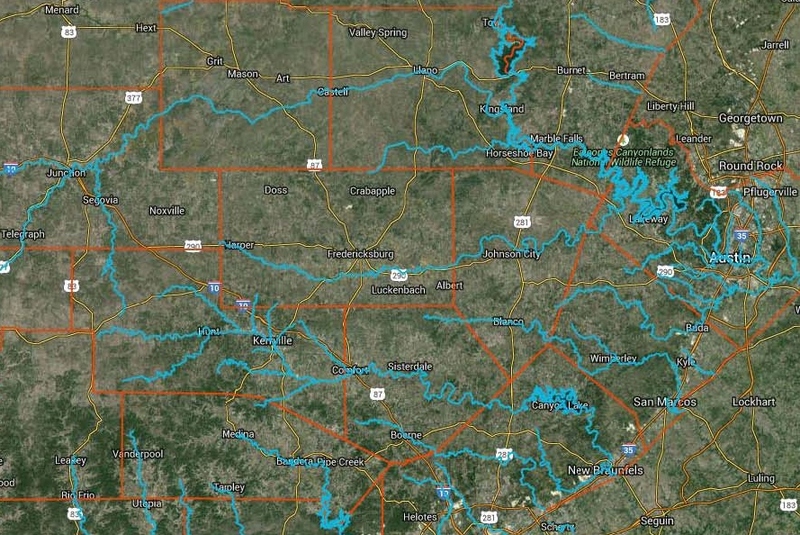 October 10, 2010 – “Legislative Action Affecting Texas Water Resources.” The Texas Legislature will be convening in 2011 and some of the most important issues they’ll be discussing will involve water right issues. 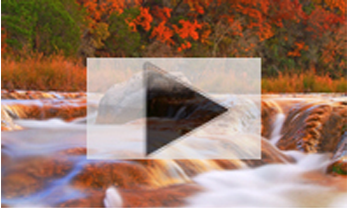 This Newsmaker Hour features the first panel discussion of the 2010-2011 Texas Water Symposium series. 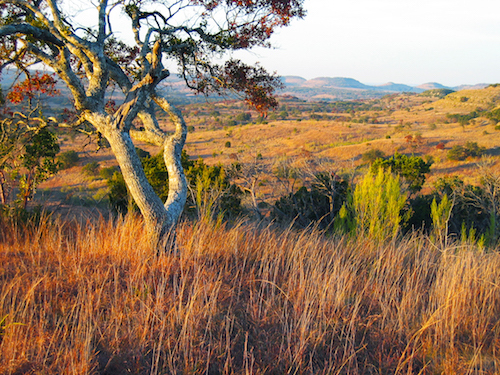 The Texas Water Symposium is a joint project of Schreiner University, Texas Tech University, the Hill Country Alliance and Texas Public Radio. The first panel discussion focused on “Legislative Action Affecting Texas Water Resources” and was held on September 30, 2010 in the Texas Capital auditorium in Austin, Texas. Christy Muse, Director of the Hill Country Alliance makes some opening remarks and introduces the panel moderator, Texas Representative Harvey Hildebran of the 53rd District. On the panel are Robert Mace, deputy executive administrator at the Texas Water Development Board; State District 132 representative Bill Callegari, currently serving as Vice-Chair of the House Committee on Natural Resources and State Representative of the 73rd District, Doug Miller, a member of the Natural Resources and Administration. November 21, 2010 – “Insidious and Stealthy: Invasive Species – Water Thieves of Texas.” The second panel discussion of the 2010 – 2011 Texas Water Symposium series, “Insidious and Stealthy: Invasive Species – Water Thieves of Texas,” was held on November 11, 2010 at the Hill Country University Center in Fredericksburg, Texas. 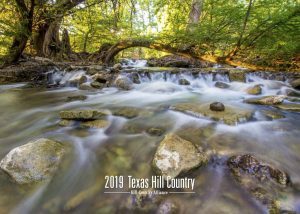 The Texas Water Symposium is a joint project of Texas Tech University, Schreiner University, the Hill Country Alliance and Texas Public Radio. Julie Martenson, Director of Off-campus sites for Texas Tech University opens the program. April 10, 2011 – “River Watch Programs and Activities in the Hill Country: How Local Communities Take Care of their Rivers and Water.” – Panelists Dr. Robert Brischetto, Cleanup coordinator for the Medina River Protection Fund; Tyson Broad with the South Llano River Watershed Alliance; and Dianne Wassenich, Executive Director of the San Marcos River Foundation. 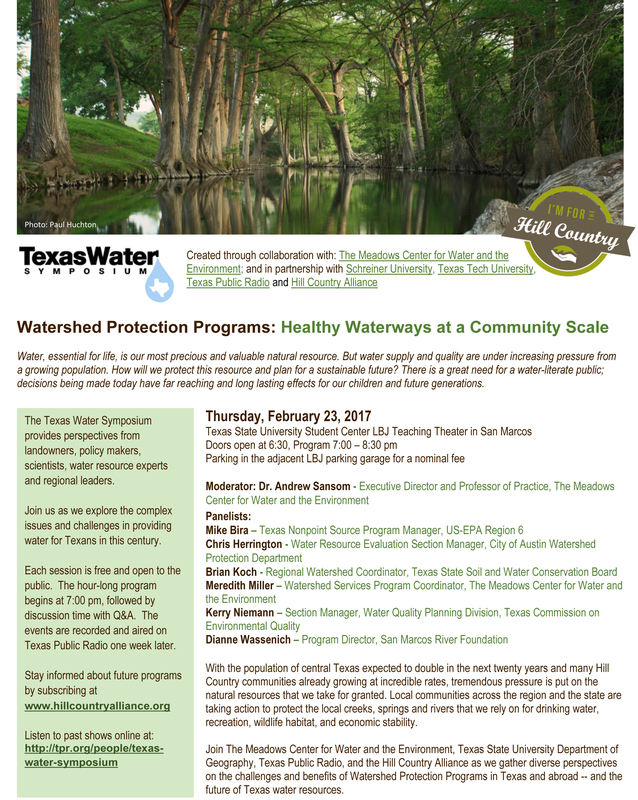 Moderating the discussion is Andrew Sansom, Executive Director of the River Systems Institute at Texas State University. Introduction by Tom Arsuffi, Director of the Llano River Field Station at Texas Tech University Center in Junction, Texas. 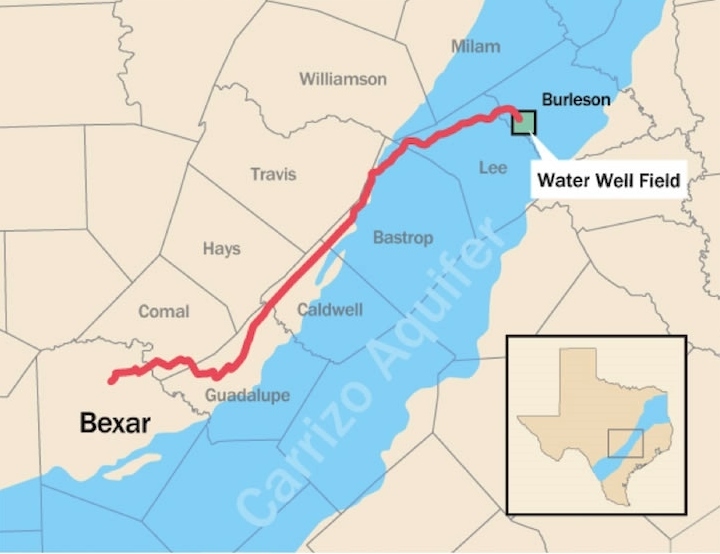 November 20, 2009 – “Our Limited Groundwater Supply: For Whose Desired Future Conditions Are We Planning?” Moderator: Robert E. Mace, Ph.D., of the Texas Water Development Board. Panelists: Mary Ellen Summerlin of the Headwaters Groundwater Conservation District, Weldon Hammond, Ph.D., of the UTSA Center for Water Research, and Gregory M. Ellis, J.D., Executive Director of the Texas Alliance of Groundwater Conservation Districts. Introduction by Tim Summerlin, President of Shriner University. 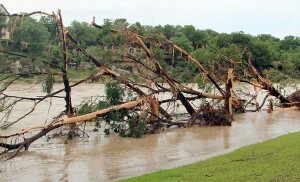 February 5, 2010 •”Climate Change and Impacts on Floods, Weather and Drought in Texas:What Controversy?” – Panelists: Robert E. Mace of the Texas Water Development Board, Todd Votteler of the Guadalupe River Authority and Katherine Hayhoe of Texas Tech University. April 2, 2010 The Texas Water Symposium – “Kids, Water, and Science: Perspectives from Our Future.” – Speakers: Irene Pickhardt, assistant director of Science for the Texas Education Agency providing leadership of K-12 science programs in Texas public schools – Introducing the winners and awarding the prizes: Cindy Loeffler, water resources branch chief for the Texas Parks and Wildlife Department and Linda Ruiz McCall, an education and outreach specialist in water science and conservation at the Texas Water Development Board. October 3, 2008 – “Texas Hill Country in Change: People, Property, Planning and Springs.” – Panelists: Chad Norris, aquatic biologist with the Texas Department of Parks and Wildlife; Bebe and Mary Fenstermaker, owners of the Maverick Ranch-Fromme Farm in northeast Bexar County; and Sean Garretson, President of Pegasus Planning In Austin, Texas. 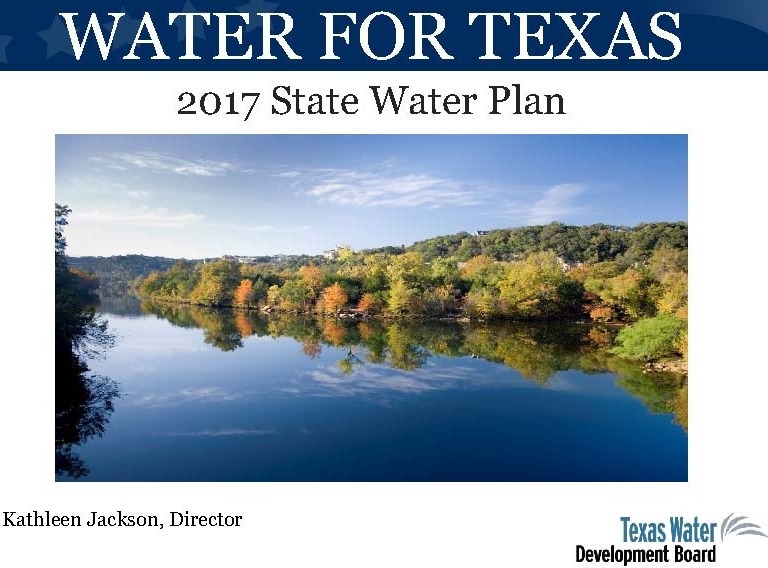 Moderator: Robert Potts, President of Dixon Water Foundation – Introduction: Tom Arsuffi, Director of the Texas Tech University Center at Junction. November 21, 2008 – “The Edwards Aquifer Juggling Act: Conservation, Springs, Alternatives and Policy.” Moderator: Robert Potts, President of the Dixon Water Foundation – Panelists: Robert Puente, President and CEO of the San Antonio Water System and Doug Miller, Chairman of the Board of Directors of the Edwards Aquifer Authority. February 6, 2009 – “History of the Rule of Capture: Its role and status in shaping water policy and planning in Texas.” – Hosted by the Admiral Nimitz Foundation and The National Museum of the Pacific War. March 20, 2009 – “Forging Partnership: Addressing Complex Water Issues in Texas.” – Moderator: Robert Potts, President of the Dixon Water Foundation – Panelists: Bill Ross, Schreiner University Wilson Fellow; A. L. “Curg” Starkey III, rancher and the great-grandson of a founding father of Kerr County and David K. Langford, Vice-President emeritus of the Texas Wildlife Association. October 5, 2007 – “More Precious than Gold.” – Panelists: Joe Beal, General Manager of the Lower Colorado River Authority (LCRA); Bill West, General Manager of the Guadalupe-Blanco River Authority (GBRA); and Robert Potts, former General Manager of the Edwards Aquifer Authority and current President of the Dixon Water Foundation – Moderator: Bill Jeffrey, Professor at Texas Tech University Law School – Introduction: Dr. Tim Summerlin, President of Schreiner University. November 16, 2007 – “H2O: The Science of Water Issues” – Panelists: Tom Arsuffi, Ph.D., Director, Llano River Field Stattion Texas Tech University Center at Junction Texas; Ken Rainwater, Ph.D. Water Resource Center Director and professor of Civil Engineering at Texas Tech University; Kirk WineMiller, Ph.D., Section of Ecology and Evolutionary Biology in the Department of Wildlife and Fisheries Sciences at Texas A&M University; and George Ward, Ph.D., Research Scientist and Associate Director of the Center for Research in Water Resources at the University of Texas – Moderator: Bill Jeffrey, professor at Texas Tech Law School in Lubbock. February 1, 2008 – Water Conservation: Taking Action for Your Children’s Children” – Panelists: John Sutton, with the Texas Water Development Board; Dr. Ken Kramer, Director of the Lone Star Chapter of the Sierra Club; Karen Guz, Director of Conservation for the San Antonio Water System and Billy Kniffen, County extension agent for Agriculture and Natural Resources in Menard County – Moderator: Bill Jeffrey, a professor at Texas Tech University in Lubbock. March 14, 2008 “Policy, Planning and Politics: Where Do We go from Here?” – Panelists: Myron Hess, legal counsel and director of Texas Water Programs for the National Wildlife Federation Austin; Texas House of Representative for District 119, Robert Puente; and Laura Marbury, Senior Water Analyst for the Texas Office of Environmental Defense Land, Water and Wildlife Program – Moderator: Bill Jeffrey, a professor at Texas Tech University in Lubbock.